From Popular Productions, the winners of the 2017 Timeout Kids Dubai Award for the Best International Theatrical Production comes the smash hit ‘Stick Man’ live on stage, direct from London’s West End. 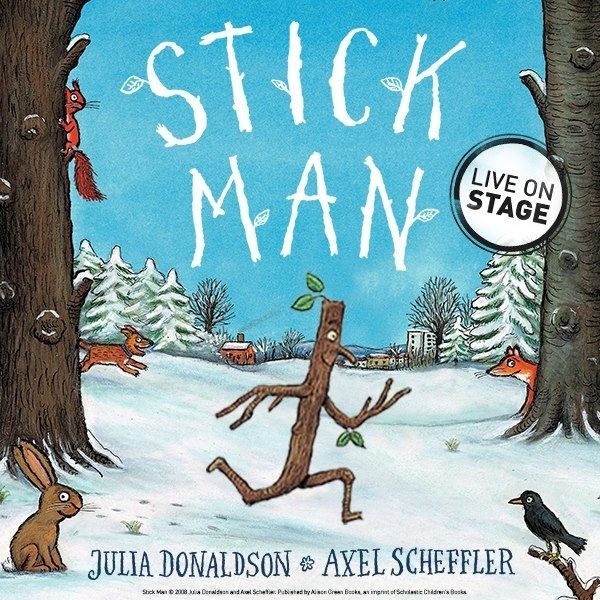 Scamp Theatre and Freckle Productions’ delightful adaptation of Julia Donaldson and Axel Scheffler’s STICK MAN is brought vividly to life in this acclaimed production. Touching, funny and utterly original STICK MAN is the perfect show for youngsters and their families. What starts off as a morning jog becomes quite the misadventure for Stick Man: a dog wants to play fetch with him, a swan builds a nest with him, and he even ends up on a fire! How will Stick Man ever get back to the family tree? This award-winning production features a trio of top actors and is packed full of puppetry, songs, live music and funky moves. Stick Man is in an official event of The Dubai Shopping Festival 2018, Dubai.92 (Official Radio), Timeout Dubai (Official Magazine) and Expatwoman (Official online partner). School performances are on Wednesday 17th January at 11am and Thursday 18th January at 10:00am.